The mission of Filter Service of St. Louis is to provide trained qualified personnel to deliver the highest level of service to every valued customer on schedule every time. After Tammy and Joe had worked several years in the corporate world, they really wanted a company they could call their own and build it into what they envisioned their destiny to be. In 1996 the opportunity came about and they purchased Filter Services of St. Louis. Filter Services of St. Louis was an existing company with existing clients that had great potential for growth and expansion. In just 5 years Tammy and Joe expanded the company to Springfield, MO. This afforded them the chance to handle the Springfield School District, which is the 3rd largest school district in the state of MO. A short time later Tammy and Joe added the Cape Girardeau, Southeast MO, and Southern IL markets as well. After 17 year in business and hundreds of satisfied clients, they have taken Filter Services of St. Louis and grown it to be a major contender in filter service business. Even though the business has grown into a large company, Tammy and Joe still keep the same excellent level of service and family business feel. It’s very important to them to maintain the personal touch and contact with each and every client of Filter Service of St. Louis. Tammy and Joe would like to thank all their clients for the continued support of Filter Service of St. Louis. Come and see how Filter Service of St. Louis can take care of all your filter service needs. 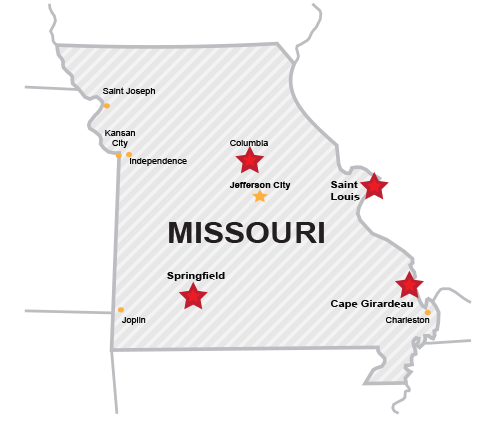 Filter Service of St. Louis services the St. Louis and surrounding areas, Springfield, MO, Cape Girardeau, MO, Columbia, MO, Central MO and Southeastern Illinios. Filter Service of St. Louis is a member of the St. Louis BBB, National Air Filtration Association (NAFA), and employ Certified Air Filtration Specialists (CAFS), who are recognized for their thorough, up-to-date understanding of air filtration technology and high level of professionalism. All of our technicians are required to and have obtained NCT certification.